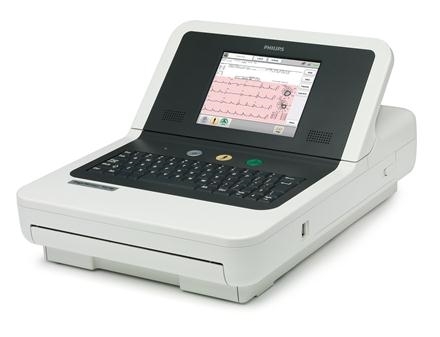 The easy to use Philips PageWriter TC30 is among the most advanced electrocardiographs on the market today. In addition to its technological sophistication and sleek design, the Philips PageWriter TC30 offers unparalleled operating speed at an affordable price and by a brand users know and trust. With reliable, user-friendly, quick operation speed, the TC30 is sure to increase efficiency in your office. 640 x 480, 600 pixel resolution VGA with 18-bit/pixel color depth. 13.33 cm wide x 9.9 cm high (5.25 inches wide x 3.9 inches high) color liquid crystal touch screen display with backlight. Voltage: 11.1 VDC (nominal), 7100 mAH (per battery). Capacity: 30 minutes of continuous Rhythm printing, or 30 total ECG reports. Recharge: less than 4 hours if cardiograph is in Standby (no in active use) to at least 95% capacity; Less than 8 hours if the cardiograph is in active use to at least 95% capacity.